Startups have raised nearly $2.5B to integrate digital features into nearly every aspect of restaurant operations. While the restaurant industry represents nearly $800 billion in annual spending in the US, it remains highly fragmented, with 90% of restaurants supporting fewer than 50 employees and 70% of restaurants operating just one location, according to the National Restaurant Association. To help restaurant managers improve operations, startups are aiming to integrate tech into nearly every aspect of the business, from CRM to inventory to engaging visitors while they wait for a table. Investors have poured nearly $2.5B into the restaurant tech category globally since 2012, across over 600 deals. There have also been a number of acquisitions, including Yelp’s recent acquisition of seating management tool Nowait, and Subway’s acquisition of mobile restaurant payments platform Avanti Commerce. Revel Systems, which had been one of the most well-funded companies in the space with $128.5M, was also acquired for over $580M by private equity firm Welsh Carson Anderson & Stowe. We’re also seeing new investors in the space. Food delivery startup Just Eat, for example, recently launched a food tech accelerator whose investments included several restaurant tech startups. 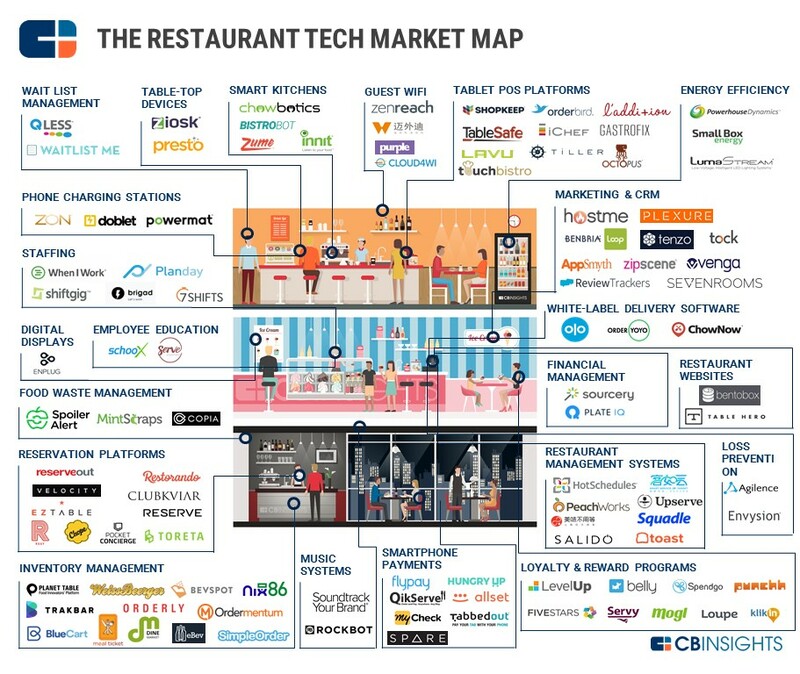 To better visualize the emerging restaurant tech startup scene, we put together the infographic below highlighting over 100 of these startups and the parts of the restaurant they target. We define the restaurant category as startups creating software or hardware to help restaurant businesses be more successful. While some of the startups below also work with other types of brick-and-mortar retailers, all have significant use cases in restaurants. We also previously looked into the transformation of brick-and-mortar retail through technologies like augmented reality product displays and shopper-tracking beacons, as well as startups focused on grocery store management here. Scroll down to view the graphic, read in-depth category descriptions, and see a company list with select investors. The graphic includes only private, active companies which have raised equity funding since 2012. Startups working on restaurant management technologies have the potential to change how people dine out. Look for Restaurant Tech in the Collections tab. Digital displays – Startups including Enplug provide digital displays for use inside restaurants, showing menu items, promotions, etc. Guest wi-fi – Startups like Zenreach in the US and WiWide in China provide restaurants with guest wi-fi systems that can also track who’s logging on and off to help restaurants better analyze customer behavior and demographics. Loyalty & rewards programs – Heavy hitters in restaurant loyalty include FiveStars ($89.9M in funding), LevelUp ($53.4M in funding), and Belly ($25.6M in funding). These startups offer points, reward systems, and sometimes pay-by-phone options for customers, as well as analytics and marketing options for restaurants. Phone-charging stations – Several startups offer stations specifically geared toward restaurants, cafes, and event venues that let guests charge their mobile phones. Powermat, which raised $5M, works with Starbucks and others. Reservation platforms – These startups, such as Resy ($15M in funding from Lerer Hippeau, Airbnb and others) work with businesses to offer reservation platforms online.This is a relatively crowded field. Smartphone payment platforms – Startups such as TabbedOut ($41.1M in funding) partner with restaurants to let guests pay and split the bill directly on their own smartphones. Table-top devices – Companies like E la Carte, with its Presto dining system, provide interactive tablets that let guests scroll through digital menus, place orders by touchscreen, and pay by card directly from the table. E la Carte has raised $68.5M in funding with clients such as Applebee’s and Outback Steakhouse. Wait-list management – Several startups help eliminate restaurant lines with mobile apps that let guests join digital queues and receive notifications by phone. These include QLess with $3.5M in funding. Employee education – Schoox and ServeAnywhere provide digital learning tools focused in part on the restaurant industry. Energy efficiency – LumaStream ($13.2M in funding) designs low-voltage LED lighting systems for restaurants. Small Box Energy ($5.6M) provides cloud-based HVAC control systems to restaurants and convenience stores to reduce energy and maintenance costs. Powerhouse Dynamics ($19.1M) works with restaurants like Burger King, KFC, Hooters, Bertucci’s, and Au Bon Pain to control HVAC and lighting and reduce energy usage. Financial management – Sourcery and PlateIQ offer financial management software for restaurants, helping with accounts payable and more. Food waste management – These startups help restaurants reduce and donate food waste. Boston-based Spoiler Alert, which raised $2.8M from investors including Campbell Soup’s fund Acre Venture Partners, is a software platform for businesses to track their surplus food, donate it or sell it at a discount, and register for the relevant tax benefits. Inventory management – Companies like BlueCart ($4.2M in funding) help restaurants track inventory levels, streamline supplier communications, aggregate different supplier orders, and analyze costs. Loss prevention – Startups such as Agilence and Envysion work with businesses to reduce losses and spoilage to improve profits. Envysion works with Chipotle, Popeye’s, KFC, Pizza Hut, and others, while Agilence’s clients include Au Bon Pain, Panera, and Cracker Barrel. Marketing & CRM – These companies focus on restaurant marketing and building and maintaining long-term relationships with restaurant visitors. Zipscene, for example, which has raised $9M, works with restaurants to gather consumer insights to offer customer segmentation and improve marketing and loyalty programs. Music systems – These startups provide smart music systems for restaurants and cafes. Rockbot ($6M in funding) gives clients like McDonalds, Panera, and Buffalo Wild Wings a digital music dashboard with curated music stations, while Stockholm-based Soundtrack Your Brand has raised $42M from investors including Spotify. Restaurant management systems – These SaaS startups provide broad management platforms for restaurants that help control things like inventory, staffing, marketing, and financial management (some other categories in this graphic show startups that focus on just one of these features). Examples include Upserve, which raised $40.4M in disclosed funding and was valued at $111M in 2014. Restaurant websites – Startups such as Bentobox help restaurants build and maintain websites. Smart kitchens – A variety of startups are working to automate the kitchen, including Chowbotics (formerly Casabots) whose first product is a robotic salad maker. Zume is a CA-based pizza restaurant that uses a patented method of cooking robots inside their delivery truck, allowing the restaurant to automatically finish cooking each pizza en route to each customer’s house. Staffing – Startups like When I Work ($24M in funding) provide software for restaurant employee scheduling and communication. Tablet POS platforms – These startups all offer tablet-based point-of-sale systems for restaurants, aiming to give servers and cashiers faster and more mobile ways to process check-outs. (These are systems used by restaurant employees, not guests). For example, Berlin-based Orderbird ($36.4M in disclosed funding) provides an iPad point-of-sale system for the catering industry. White-label delivery platforms – We’re all familiar with Seamless, of course, but the startups in this graphic offer white-label platforms for restaurants to create and manage their own online ordering and delivery systems. OLO leads with $62M in funding. Want more data on food tech and restaurant tech financing trends? Log in to CB Insights or sign up for free below. A weekly research publication tracking consumer packaged goods startups, investment trends, emerging technologies, and innovations, and their impact on existing CPG leaders.